I read Dan Brown’s The Lost Symbol the week it came out (was that really only three months ago?) and shortly after I was done, I began outlining an unconventional theory about the novel’s magical properties over at GalleyCat. Those posts came to the attention of Dan Burstein, who began publishing unauthorized guides to Brown’s work around the time of The Da Vinci Code—years before this latest was even announced, he’d shepherded a book called Secrets of The Widow’s Son into print that accurately pinged several elements of the final storyline—and he invited me to expand my thoughts in an essay for Secrets of the Lost Symbol. Officially, the hardcover edition of that book is still two weeks away, but electronic editions are now available, in the Adobe Digital Editions format or a Kindle edition. I’m only a few chapters into it—after skipping to the back, where my piece on “Dan Brown’s ‘Great Work’” is the penultimate contribution—but I’m really interested to see what other people discovered in this novel. One major motivation for my curiosity is that I’ve agreed to participate in a panel at the 92Y Tribeca next month, “Secrets of Dan Brown’s The Lost Symbol,” in which—as the official description puts it—”Time magazine’s Lev Grossman leads a discussion with four writers who’ve subjected Dan Brown’s prose to intense scrutiny and are ready to share their insights and speculations on the author and his works.” Lev wrote one of the first and smartest reviews of The Lost Symbol, so he’s a great choice to steer the discussion; Dan Burstein and I will also be joined by Mitch Horowitz, the editor in chief at Tarcher/Penguin and the author of Occult America—so he can speak to the mystical and neo-scientific elements of Brown’s story—and bestselling YA author Maureen Johnson, who wrote a hilarious online readers’ guide that nails everything that’s awful about Brown’s prose. 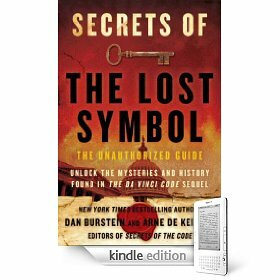 That brings up an important point: I think The Lost Symbol is better written than any of Dan Brown’s other books—for one thing, I could actually bring myself to keep reading it all the way to the end—but I still think it’s packed with bad writing. And yet… I am willing to concede that I may be in the position of John Bunyan’s contemporaries who thought the language of The Pilgrim’s Progress was banal and wretched, as it’s entirely possible that The Lost Symbol is the greatest American spiritual allegory since Funkentelechy Vs. the Placebo Syndrome.